The Benchmade 755 MPR ($235) is one heck of a heavy, bulletproof knife. The M390 super steel blade is one of the thickest blades we’ve ever seen at a whopping .164″ almost double that of a standard blade. 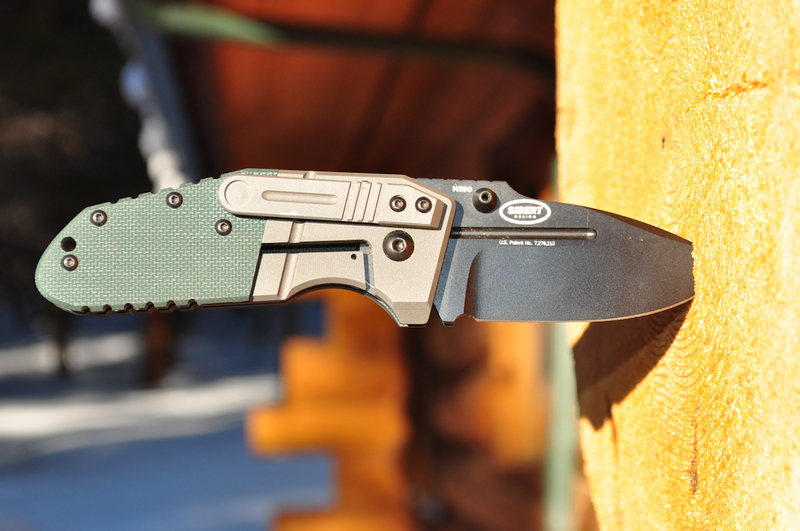 Steel grades can get a little confusing but it’s definitely worth noting that the 755 MPR’s M390 is magnificent steel. M390 has exceptional wear and corrosion resistance. Having cut just about everything while the knife’s been in my possession including cord, rubber, and it shames me to say but a tin can when the opener was left at home I can attest to the Benchmade 755 MPR being damn near impossible to dull. I haven’t sharpened it yet and it’ll still fillet a piece of card stock like a hot knife in butter. The blade has ambidextrous thumb studs and smoothly opens until locked into place by the titanium mono-lock. The handle is G10 laminate which in my opinion is the only suitable handle material for a knife. A little education: G10 is a glass woven fabric, impregnated with epoxy under high pressure. The G10 here is precise, and grippy under any condition including wet, snow and ice. It even gripped well in gloves. As with most of the knife the pocket clip is over-engineered. The pocket clip is very stiff and at times can be difficult to slide over the pocket to clip, especially thick clothing. The upside is that the knife won’t go wandering when it is clipped. No question about it, this is a hell of a knife. Suitable for everything from everyday carry to tactical use to opening a can of beans when you forget the can opener.